Traveling Tractors – all for a good cause! Calvin Elder’s farm is in rural Mt. Auburn and today the farm was the site of a tractor drive. Antique tractor collectors that were mostly Ansar Shriners and Ag Corps members brought their tractors for the 27 mile drive for fun and to raise money for a good cause. The funds go to the Ansars who distribute the money to hospitals to help children. I knew of this event but this was the first year that Keith and I were able to attend. It is a touching scene to see tractors of many colors driving down the road with flags flying behind them in front of a corn field. The rural roads came to life under the auspices of Allis Chalmer’s Persian orange, Farmall red, Minneapolis Moline Prairie gold, John Deere Green, Oliver Green and Case and Massey reds. The clouds while heavy just served as a backdrop during the ride and the group successfully completed the drive and consumed the wonderful pork chop dinner before the rain came. “You are a lucky guy,” one collector quipped to Calvin when I was interviewing him for my Farm World story about this event. You often think of traveling, and driving, but not always by tractor. Traveling for a good cause in a distinctive vehicle brought about a lot of smiling faces on the drivers and those that came out to witness the event. If you have a tractor and get a chance to be part of one of these drives consider doing it, you get a different view from the tractor seat! 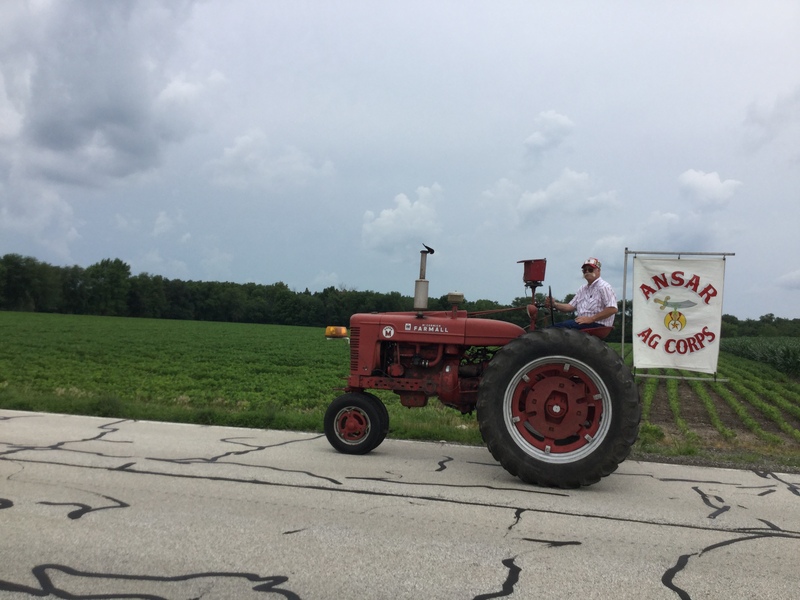 This was the 7th year for the Ansar Shriner/Ag Corps tractor event that last year brought in around $2500. “It is all for the children,” Calvin said. His wife Sandee agreed. The couple took the time to open up their farm and their hearts for this event. I must say though that while the couple said it was all for the children, while I agree the funds were, the fun itself was for the drivers who ran their “toys” in road gear all for a good cause.